There is not time to explain! You must win this race. Control your jet ski and beat all opponents as soon as possible. Everything depends on you, so do not waste your time and drive like a professional. We know that you will do it! Just have faith in yourself. Did you see that? This is the best game for you! Cause here you will drive a real jet ski! The world is in an apocalyptic state after witnessing the worst floods in human history. 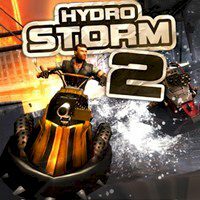 So, the remaining survivors are constantly battling with each other on the seas in the most intense, thrilling, destructive jet ski racing game you will ever play. In this game every jet skis are designed differently to suit your driving needs and are equipped with machine guns, shotguns and mini guns to blow your opponent out of the water! Ready? Then use arrow keys to move and z, x to shoot.